Eagle's Edge Campsite in October! In 2013, a young man named Jacob Ax from Munnsville, NY started thinking early about his Eagle Scout project. Luckily, his parents were summer employees at Oswegatchie and he was familiar with our place. Over the years, he knew we had a remote location that was perfect for a new campsite. After a conversation with the camp management, he set out to build 2 large tent platforms. A few months of fundraising, recruiting volunteers, and designing the platforms, he was able to build what is now called "Eagle's Edge Campsite. After learning more about the eagle scout process, we realized that we could enable so many more scouts to join Jacob in the proud brotherhood of eagle scouts. Since 2013, we have had 3 eagle scout projects accomplished. Oswegatchie has 70 buildings of all shapes, sizes, and conditions. We have a large footprint for our main camp area and need help with things like firewood. This place is rich with opportunity for individuals that want a project and have a certain amount of the prep done in advance. Whether you are a scout, FFA member, or any person in need of service hours, we can offer you a win / win! The eagle scout candidate needs to manage other volunteers to complete a minimum of 40 manpower hours. A financial commitment is typically required. You need to be a Life Scout before starting the the eagle scout process. Oswegatchie does have these requirements. You must complete the amount of hours you commit to accepting. You will need to submit your plan for eagle scout to us in advance of submitting it to your approval committee. Let it be known, that in most of our projects, we can provide the supplies, but we will expect a $250 cash contribution from the scout. If the project needs no additional supplies such as maple sugaring or firewood, no cash will be needed. Oswegatchie can offer lodging, but this will typically be at a campsite. Scouts will need to provide their own food and food prep at the campsite. 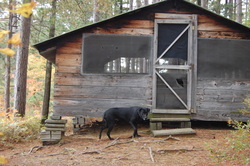 An example of a cabin needing work. The best opportunity for service projects that we have are our campsite cabins. We have 40 campsite cabins that all need some sort of work. Each cabin requires closing of gaps in the walls and floor,staining, screen work, steps, constructing wooden bunks, and various other tasks. Since the cabins are very important to Oswegatchie and we want to make sure scouts are committed to their project. Oswegatchie will pay for the majority of materials, but we do require the scout to pay $250 towards materials as a sign of commitment. Finishing the individual cabin project is required before we sign off on the project. Volunteer groups can stay at the campsite overnight if needed for a weekend of work. Planning ahead for your own meals would be also the scouts responsibility. It is also recommended that the scout visit to see a campsite in advance. Also, if multiple scouts from one troop could take on multiple cabins at the same time. Most campsites have 3 cabins, making it ideal for multiple projects simultaneously. Contact the Camp Director via email to start a conversation! 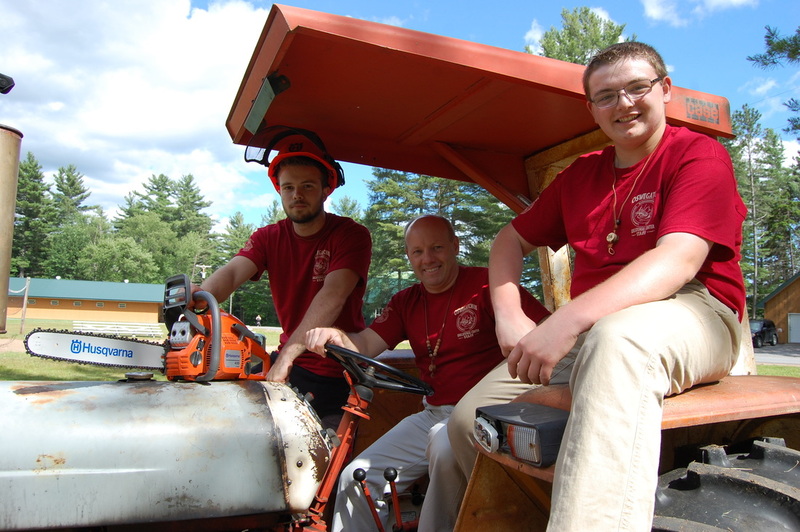 Oswegatchie has a major need for firewood labor. Typically we have firewood logs on deck and ready for cutting, splitting, and stacking. If a leader was able to coordinate other volunteers, an important amount of work would get done. We burn firewood since it is more cost effective than fuel oil. By getting volunteer labor to process the firewood, you double the value in savings for Oswegatchie. Oswegatchie has offered mountain bikes as part of our summer program since 1992. With the hundreds of mountain bike rides going out each summer, we have found that novice riders tend to break more bikes and injury them self on longer rides. In a clever way to reduce damages and make that program more exciting, we are working slowly towards building a pump track! ​Oswegatchie needs a group of hard work scouts to move soil, logs, and debris in order to make an oval loop in the woods work. Scouts should expect shovel, rake, wheel barrows to be the primary tools, but strong backs are a must! 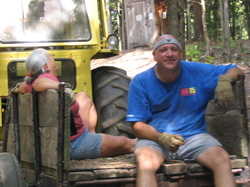 Email the camp director at wwaite@oswegatchie.org for this rare and unique chance to build something rather exciting! Since this is specialized work, there will be a need to do some research before starting the project. Whether it be autumn or spring, we have a tremendous amount of work to do prepping the facility. Raking, moving equipment, opening buildings, or marking trails. If a group or individual needed to clock time, we can work with you. Sugar season is a 3 month time frame that requires much manpower. Our chief sugar maker, Jamie Thibodeau needs help. Any volunteer could clock significant hours starting in February till April and learn a variety of skills. Depending on your needs we can help you out. However, weather dramatically shifts when work is needed. You can not predict the start or end of sugar season, or when you need to boil. This is hard work and would be great for a team of volunteers to fill in as the schedule shifts. On a career level, the maple season is the best skill building opportunity we have available. (The age of the average sugar producer continues to increase, leaving more opportunity for the next generation of producers.) In addition, Oswegatchie offers an excellent maple sugar education field trip. Teaching experience is also an opportunity. Service projects for Individuals and Groups!